The hip is a ball and socket joint that connects the femur (thigh bone) to the pelvis. The two main parts of the hip joint are the femoral head (ball) and the acetabulum (socket). The articulating surfaces of the femoral head and acetabulum are covered in a lubricated low friction and wear resistant cartilage known as hyaline cartilage. The labrum is a supporting cartilage that attaches about the outer edge of the socket and functions similar to a fridge seal or gasket. 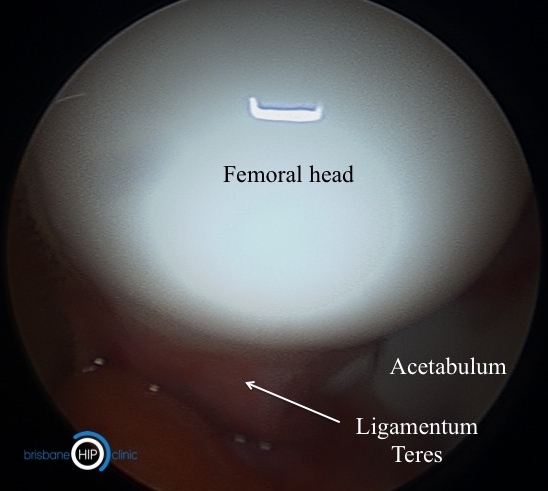 Deep inside the hip joint, ligamentum teres connects the femoral head to the acetabulum. The hip is supported and made more stable by connected ligaments, tendons and muscles outside the joint. 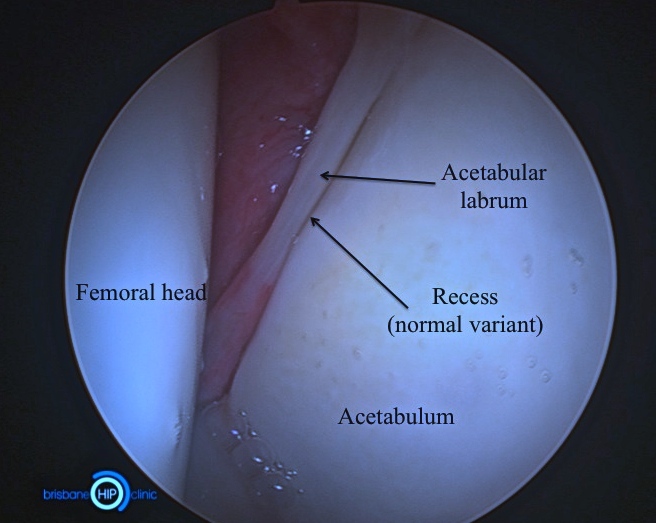 Figures: Arthroscopic images of the normal hip. Arthritis is the wearing of the joint that includes thinning and damage to the cartilage, together with the formation of bony spurs and cysts. There are a number of different types of hip joint arthritis; the most common is osteoarthritis. Osteoarthritis is a process of gradual mechanical wearing of the joint, accumulated over a long period of time. 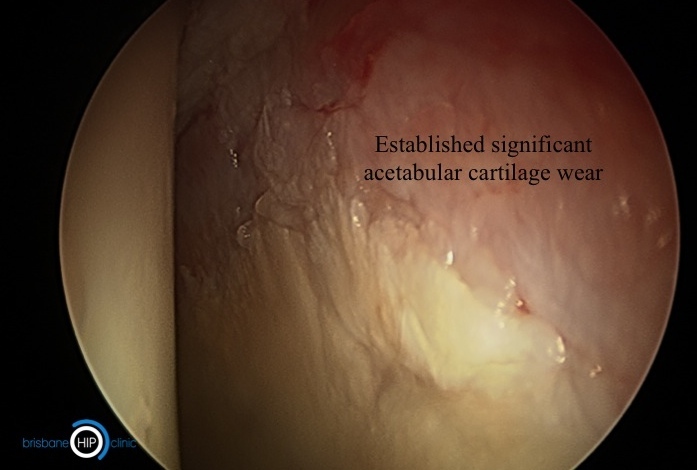 Cartilage wearing within a joint is best thought of as a spectrum - from minimal damage isolated to a specific section of the joint progressing through to established wear and bone on bone contact effecting larger regions of the joint. The degree of wear accumulated and nature of the symptoms experienced will often influence the recommendations for treatment. People with hip arthritis typically experience groin and buttock pain which gradually worsens over time. Pain is also often felt in the thigh and sometimes the knee; this is known as 'referred pain'. Intermittent episodes of more severe discomfort lasting days or weeks are common. Hips that have arthritis gradually become stiff, which can cause difficulty with daily activities such as putting on footwear. Painful catching and night pain are other common symptoms. Can hip arthritis be treated without surgery? Yes. Many patients with hip joint arthritis benefit from non-surgical treatment. Non-surgical treatments may reduce pain and improve function, delaying or removing the need for surgery. For this reason, I strongly recommend patients with hip arthritis trial non-surgical treatments before undertaking an operation. It should be noted however that most types of arthritis are permanent and progressive. While non-surgical treatments may assist in improving your symptoms, the condition will remain. If your symptoms are persistent despite adequate non-surgical treatment, then an operation may be a better alternative. See 'Non-Surgical Treatments' for further information. Artificial joint replacements are a reliable and safe way of providing excellent long term pain relief. For patients who require artificial joint replacement, the alternatives include Total Hip Replacement (THR) or Hip Resurfacing. Some patients with less extensive joint damage may benefit from hip arthroscopy (key-hole surgery) or other joint preserving surgical procedures. I will recommend a particular treatment based on your individual requirements. What about my labral tear ? Osteoarthritis is a condition that effects the whole joint - typically degenerative tearing of the labral cartilage is also observed in association with the development of osteoarthritis. Whilst labral tears may contribute to the pain associated with osteoarthritis the far more significant factor influencing outcome is the degree of wear sustained to the hyaline (gliding) cartilages lining the joint. 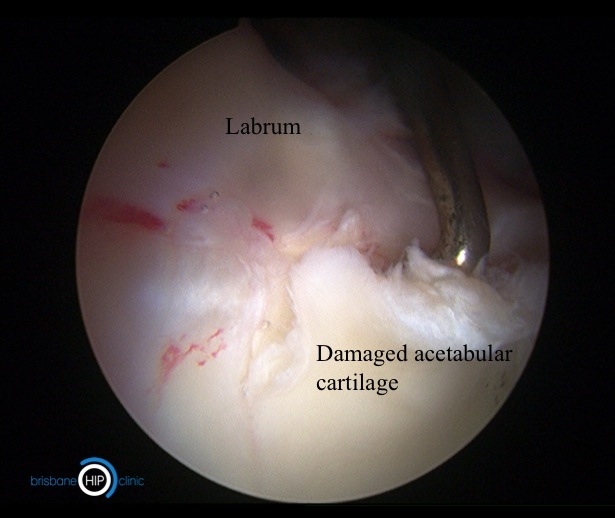 In circumstances of significant osteoarthritic wear, treating the labral cartilage tear alone is very highly unlikely to make a worthwhile impact upon the symptoms. For this reason, arthroscopy is rarely recommended for the management of osteoarthritis of the hip, even if a labral tear is observed on MRI. If the degree of ostearthritic wear is of lesser grade, arthroscopic treatment of the labral injury may be effective in reducing pain. Figure: Arthroscopic image of right hip joint demonstrating moderate grade osteoarthritis. In the early to moderate stages of hip osteoarthritis, the damage is often confined the acetabulum (socket), with femoral head damage occuring relatively late in the disease process. Figures : Two distinct patterns of wear. Acetabular cartilage wear in the hip joint occurs in two distinct patterns that can be understood by considering these examples. 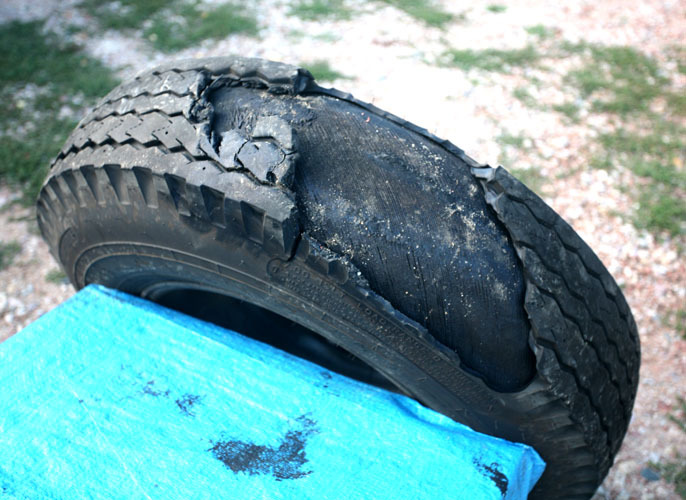 The upper two images demonstrate thinning and failure of the bearing (tyre or cartilage) as a result of the accumulation of microscopic wear damage over a long duration of time. This best describes "ordinary" osteoarthritis due to wear and thinning of the cartilage bearing surface. The lower two images demonstrate a very different mechanism of damage - the bearing surface itself is of good quality but it is losing contact and delaminating in full thickness sheets, like a car tyre re-tread detaching (lower left). This second mechanism of cartilage failure is typical for cam-type femoroacetabular impingement (link). 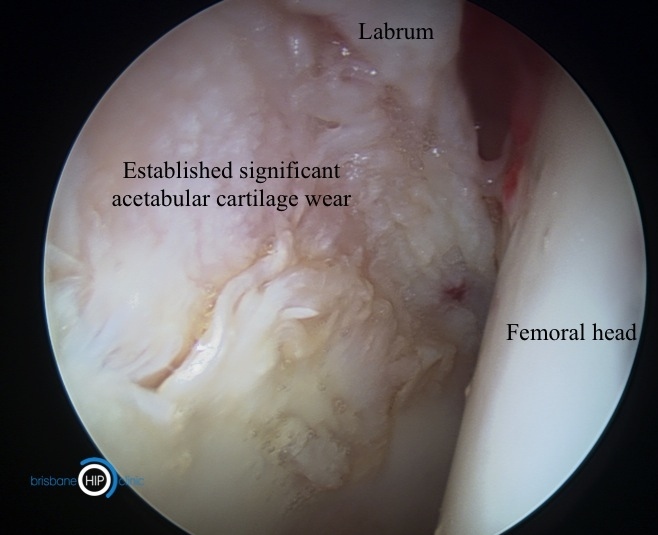 If caught in the early stages, the delaminating cartilage can be salvaged and reattached by arthroscopic methods.